Pulling into the parking lot piled high with snow at 4:00 a.m., Dane knew that those workers’ vehicles without four-wheel drive would never make it in or out of the valley safely. The park would be closed for the day. Dane called the dispatcher, and she reassured him that she would notify his four workers that plowing would commence the next morning, and they might as well just stay home today and wait out the storm. He knew they would be grateful for the call despite the abrupt, early-morning ring. Easing out of his Jeep, Dane arrived at his office, a simple, cozy 10-foot by 10-foot wood-paneled room at the end of six garage bays. His dog Ella leaped from the driver’s-side seat into a tall snow drift, hopped to the office door, and shook off the flakes. Dane keyed into the darkness and turned on a corner lamp that gave the room an orange glow. The gas-burning heater hissed quietly in the other corner, and Dane turned the knob a bit; its visible flames leapt as the heat came forth. Ella found her pillow near the heater and immediately settled in. Placing his briefcase on the desk, Dane fumbled with the filters and coffee until the brew was perking steadily. While he knew he should turn on the overhead light to let passersby know he was on the job, the atmosphere was so peaceful and the room lit so well, he wanted to savor the moment. As he gazed out the window at the piling snowfall, he murmured a prayer of thanks for allowing him to earn a living in a place he loved so much. He called headquarters and let them know of his decision to shut the place down for the day. Everyone seemed to understand, and it appeared his peers had made similar decisions throughout the park district. He decided to complete his shift in case someone got stuck in the park, went off the road, or had some other emergency. At first light, he would drive through the parkway intersections and post barricades to prevent people from attempting the unplowed streets. Despite the warnings, he knew there would always be a chance-taker or two. For now, he simply needed to establish a presence, which he had done through his calls to the main office and dispatch. He finally turned on the overhead light. Ella snored softly from her pillow. As the two men enjoyed a quiet breakfast, they discussed the scores from the previous night’s games, the politicians making a mess of things in Washington, and the likelihood of the storm lasting more than a day. Sam related a story of his father-in-law taking a tumble off a ladder, but nothing was broken and he would be okay. Dane was always struck by Sam’s allegiance to that man. Having lost his own father at a young age, Sam had an unusual loyalty to his wife’s father. It was odd how a man who never had a son and a boy who barely had a father would meet. Sam’s wife, an only child, was a fortunate benefactor of this relationship. The family was truly blessed. When Sam’s mother-in-law passed away, his father-in-law moved in at Sam’s insistence, and they all got along beautifully. Sam handed Ella a little muffin his wife had made just for her, as her tail thumped against the metal heater that clanged like a school bell. Returning to her pillow, she ate her snack deliberately. The cups were drained, and the conversation slowed. Sam left to make his rounds. Dane and Ella jumped back in the Jeep and went off to set up the barricades. On the way back to the office, Dane came upon a set of tail lights about 40 feet into the wood line. 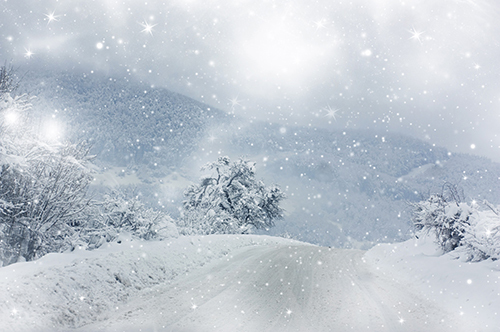 Engaging the emergency flashers, Dane waded through the snow to the door of a 4 x 4 pickup truck. Lowering the window, a man dressed in a sharply tailored business suit was shaking his head. “I don’t understand. It’s a four-wheel drive!” Dane exhaled, “Yes, sir, but that doesn’t mean you can go 50 miles an hour on a road you should only be doing 25 on when the pavement is dry!” The gentleman nodded. Dane hooked a winch onto the rear axle and slowly dragged the truck out of the woods and onto the roadway. When Dane unhooked the cleat, the driver sped off without so much as a thank you, or even a toot of the horn, leaving Ella and Dane standing in a fog of exhaust and snow. Dane just shook his head. Once he had finished the day’s paper requirements, Dane locked up and headed for home. The snow was still falling, but the winds had let up considerably, and it appeared tomorrow’s weather would be less drastic. His wife had put a pot roast in the slow cooker around noon before leaving for the corner general store where she worked. Dane had been waiting all week for that roast, and his stomach growled at the thought of it. He reached out and patted Ella, who simply gazed at the whitened trees out of the passenger window. Reflecting, Dane realized he could have called off that day. He might even have just come in and cursed the weather (which he could do nothing about) because of the inconvenience it caused. That guy he had towed out was very rude, but Dane had learned to expect little out of people anymore. What drove him to make the extra effort that day? What makes some people thrive each day as opposed to just live? Perhaps a voice that says, “Do it anyway.” Dane had secured his post, made the world a little safer for some people he would never meet, and enjoyed the company of a good friend.